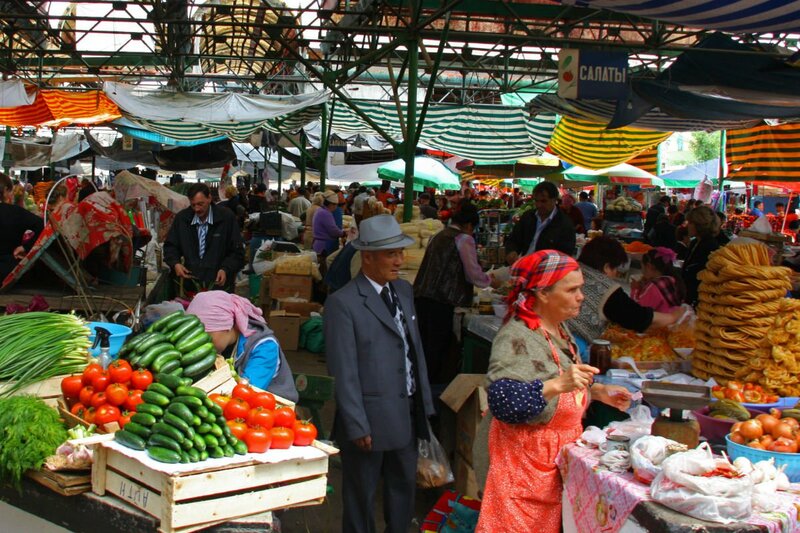 The bustle of the Osh Bazaar. Photo by Neiljs. Visitors will be pleasantly surprised by how much Central Asia's sleepy hidden gem of Bishkek has to offer. BISHKEK, Kyrgyzstan – Some say there is not much to do in this low-key Central Asian capital city, but I disagree. Bishkek is full of charming restaurants, cafes, bars, shopping, and other opportunities for unwinding and enjoying a slower pace of life. In the only democratic country in Cetnral Asia, classic Soviet architecture juxtaposes with a liberally minded, young population and a surge of newly opened, Western-inspired businesses. At present, one U.S. dollar is approximately 70 Kyrgyz som. To give you an idea of how affordable this city is, a beer runs you around 100 som, and restauraunt meal is likely not to exceed 500 som. If you are on a tight budget, a meal from street vendors can be as little as 75 som, making Bishkek delightfully affordable. Stay a few days while planning excursions to nearby Lake Issyk Kul, or trekking, hiking, and camping in the surrounding mountains and national parks in the reigon, and you’ll be eager to come back. Here are a few places to check out while you're in town. West side of town, at the intersection of Kiev (киев) & B. Beyshanalieva (б. бейшеналиева) Sts. The sprawling, once-in-a-lifetime shopping experience. Feel the Silk Road legacy of centuries past in the biggest bazaar in Bishkek as you shop and haggle along with the locals. You will find vendors from all over Central Asia and China selling everything under the sun, from designer knockoffs and electronics to local spices and teas, fermented camel and horse milk, and handicrafts. East side of town, at the intersection of Chuy (чуй) Ave. & Shabdan Baatyr (шабдан баатыра) St. The Uyghur people, an ethinc minority of Turkic Muslims who inhabit Northwest China, flock to the Madina bazaar for textiles as well as a smattering of truly delectable restaurants serving the food of their culture. Come here less for the shopping and more for the food. Order the lagman, a dish of hand-pulled noodles with meat and vegetables, eaten alongside pots of tea (чай- pronounced "chai"), but don’t be afraid to try any and all of the unique dishes being offered. An Obama-themed bar in Bishkek? Why not! The delightfully strange Obama Bar is a surprising find. Take a photo with the life-sized cardboard cutout of the president at the door, stay for the pleasant menu of “American” food. There is chicken and there is tango night (Mondays, 7 p.m.). The popular resturaunt is known for Korean fried chicken and expansive coffee menu. It may sound like an odd mix of cultural influences, but the crowds that come flocking through the open doors are a testament to its success. Check the restaurant's active social media account to see what's happening. A spacious bar and restaurant with an in-house brewery, one of the largest beer selections in the city, and a great gathering place for friends new and old with a few pints. It seems almost out of place because of its majorly cool vibe. If this bar was in NYC, the drinks would be going for $20 bucks a pop. But this is Kyrgyzstan, where you can enjoy yourself at arguably the nicest rooftop patio in the city while spending about five dollars. Heavy on the Euro club décor (think: colored lights and white couches), the view is unrivaled. Ala Too square in all its post-Soviet glory. Photo by . 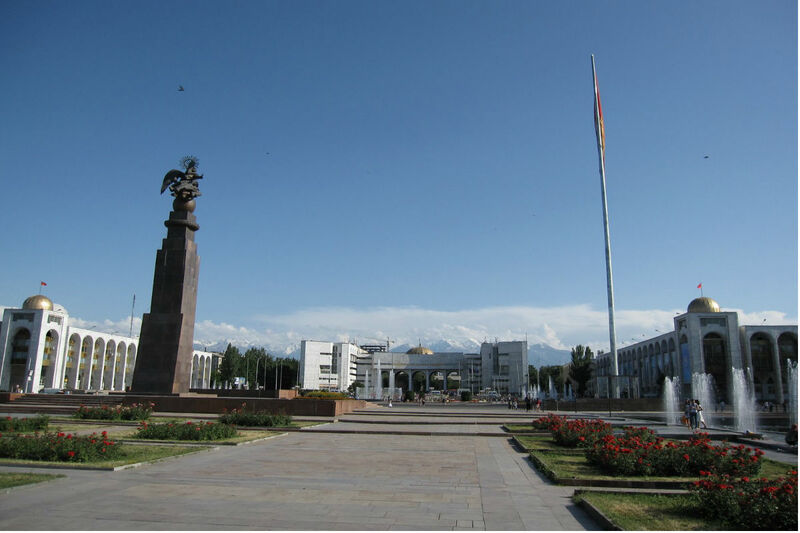 The formal town square of Bishkek was built in 1984 to commemorate the 60th anniversary of the Kyrgyz Soviet Socialist Republic and has been the site of the protests that led to the country’s Tulip Revolution in 2005. The square offers a chance to see the Kyrgyz version of the White House, home to the only democratic government in Central Asia. Also on display is a monument to Manas, a famous legend in the Kyrgyz culture and subject of an epic poem dating back 1,000 years. The surrounding streets are home to the offices of many tourism companies. On the southern outskirts of Bishkek sits the Supara Ethno Center, a one-stop shop for experiencing Kyrgyz culture. The complex offers visitors the chance to try traditional Kyrgyz outdoor activities, like horseback riding, archery, and fishing (they’ll even cook the fish you catch). On the complex sits a plethora of yurts of all different types and sizes as well as traditional stone houses, most of which can be used as the locale for a traditional Kyrgyz meal served by the in-house restaurant. Sink your teeth into beshbarmak, the national dish of Kyrgyzstan, which is a platter of noodles and horse meat eaten by hand, and shashlik, a dish featuring skewered chunks of meat grilled over an open fire.